A joint credit card account might fit your style as a newly married couple. Wedded bliss often entails joint bank accounts as you and your beloved meld your finances into one tight union. You may decide that you want to hold a joint credit card account, with both of you sharing equal rights and responsibilities for the debt you may accumulate. Lending institutions usually allow two cardholders on an account, but you’ll want to move forward with this financial step with both eyes wide open for best results. Gather your personal and financial information so you’re ready to fill in the blanks of the credit card application. You’ll need proof of income and employment, as well as Social Security numbers and picture IDs -- such as a driver’s license -- for both of you. Fill out the application together. You’ll both be responsible for the credit card account, so it’s reasonable to begin this process together. Read through the terms and conditions of the account together so you both understand your rights and responsibilities. Note the features of the card, such as cash rewards, bonus points, liability guarantee and overdraft protection. Check the interest rates and other fees that you’ll be responsible for paying. Learn about cash advance policies, balance transfers and other relevant details like minimum interest charges. Sign on the dotted line when you’re ready to proceed. If you’re applying online, you’ll just have to click the “submit” button to apply for the joint credit card account. Submit copies of documentation needed by the bank to verify your information. This could be pay stubs, income tax returns or driver’s licenses. If you applied online, you'll have to scan these documents and transmit them by fax. Receive your credit cards if the bank approves your application. Once you receive the cards, sign and activate them to start using them. Do a little preparation before opening a joint credit card account to make sure you and your significant other are on the same financial wavelength. Since you’ll both be legally responsible for paying any debt, there’s got to be some trust and open communication. Make an agreement about how you’ll use the cards and figure out who will make sure the bill gets paid on time each month. If a joint account doesn’t seem to fit, consider using an individual account owned by one partner and designating the other partner as an authorized user. This gives both partners the ability to use the account with only one partner having legal responsibility for the account. If things don't work out, the account owner can remove the authorized user's access to the account. 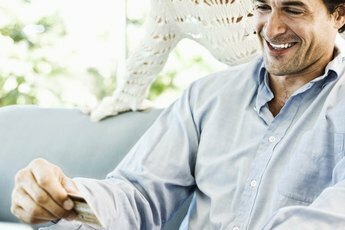 Credit.org: Should Newlyweds Open a Joint Bank Account? 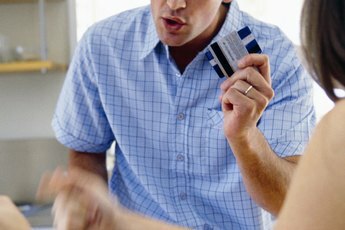 Do Credit Cards Check Your Bank Balance Before Issuing You a Card? Can Unmarried Couples Have a Joint Checking Account? Can a Joint Account Holder Remove Himself? Can You Have a Co-Signer on a Credit Card Removed?